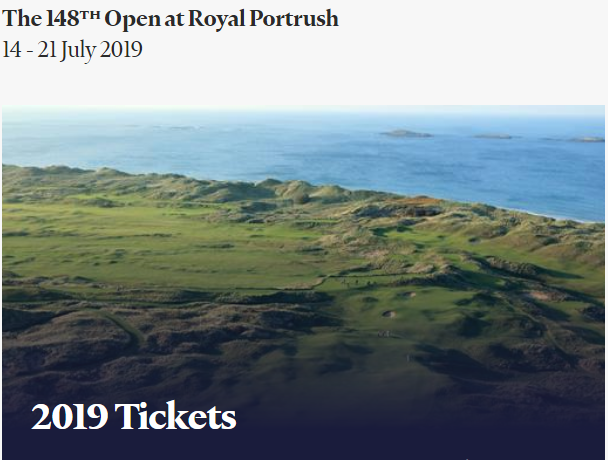 There seems to be a general perception that there are no tickets available for this year’s 148th Open at Royal Portrush. We’ve seen it in the media and online and indeed from our clients who have come to us querying if this is in fact true. Therefore, we feel obliged here at Golf Vacations Ireland to put the record straight as we don’t want potential visitors to this amazing event unintentionally missing out. So why the confusion? Well, there’s no doubt that interest in this year’s event is huge! When a large selection of tickets went on sale via The R&A website last July, they sold out in record time – for the first time ever. This was widely reported and led to the belief that this was a ‘sell out’ event. As a result, golf enthusiasts around the globe are of the opinion there are no tickets available, apart from some practice day availability. Platinum Package: 5 night stay in 4* Hotel in Belfast or Derry, 2 rounds of golf including Golf Digest’s number one rated Royal County Down and tournament tickets to the final weekend at The 148th Open. Prices per person self-drive group of 4 from £2,230 GBP. We are advising all our customers to book as soon as possible to avoid disappointment.